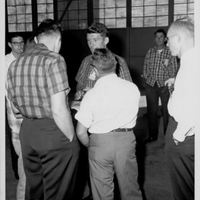 Astronaut Wally Schirra (1923-2007) at a post-flight event. Dr.Calvin D. Fowler, the Launch Conductor at Cape Canaveral Air Force Station (CCAFS)'s Launch Complex 14 (LC-14) in Cape Canaveral, Florida, presented Schirra with the key to launch Schirra's spacecraft, Sigma 7, into orbit on October 3, 1962. Mercury-Atlas 8 (MA-8) was the fifth manned space mission and was launched as part of Project Mercury. 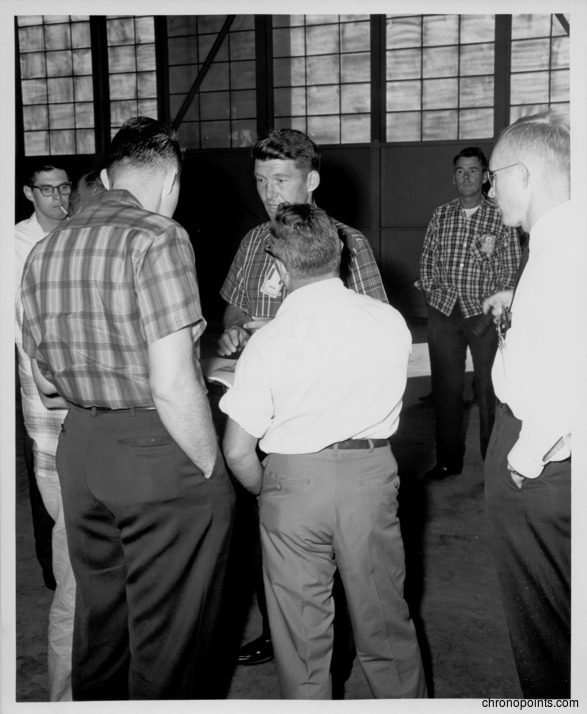 “Wally Schirra and Others at Post-Flight Event.” RICHES of Central Florida accessed April 22, 2019, https://richesmi.cah.ucf.edu/omeka/items/show/6395.